German Workers' Party : Adolf Hitler Mein Kampf - Nazi Germany World War 2 Section. 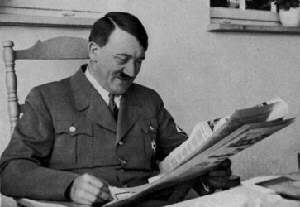 Hitler reads newspaper to find out how the war is going. ONE DAY I received orders from my headquarters to find out what was behind an apparently political organization which was planning to hold a meeting within the next few days under the name of 'German Workers' Party'- with Gottfried Feder as one of the speakers. I was told to go and take a look at the organization and then make a report. The curiosity of the army toward political parties in thosedays was more than understandable. The revolution had given the soldiers the right of political activity, and it was just the most inexperienced among them who made the most ample use of it. Not until the moment whenthe Center and the Social Democracy were forced to recognize, to their owngrief, that the sympathies of the soldiers were beginning to turn away from the revolutionary parties toward the national movement and reawakening, did they see fit to deprive the troops of suffrage again and prohibit their political activity. It was illuminating that the Center and the Marxists shouldhave taken this measure, for if they had not undertaken this curtailment of ' civil rights '- as the political equality of the soldiers after the revolution was called-within a few years there would have been no revolution,and hence no more national dishonour and disgrace. The troops were then wellon their way toward ridding the nation of its leeches and the stooges ofthe Entente within our walls. The fact that the so-called 'national' partiesvoted enthusiastically for the correction of the previous views of the Novembercriminals, and thus helped to blunt the instrument of a national rising, again showed what the eternally doctrinaire ideas of these innocents among innocents can lead to. This bourgeoisie was really suffering from mental senility; in all seriousness they harbored the opinion that the army wouldagain become what it had been, to wit, a stronghold of German military power;while the Center and Marxism planned only to tear out its dangerous nationalpoison fang, without which, however, an army remains forever a police force,but is not a troop capable of fighting an enemy-as has been amply provedin the time that followed. Or did our 'national politicians' believe that the developmentof the army could have been other than national? That would have been confoundedly like the gentlemen and is what comes of not being a soldier in war but a big-mouth; in other words, a parliamentarian with no notion of what goeson in the hearts of men who are reminded by the most colossal past that they were once the best soldiers in the world. And so I decided to attend the above-mentioned meeting of this party which up till then had been entirely unknown to me too. In the evening when I entered the 'Leiber Room' of the former Sterneckerbrau in Munich, I found some twenty to twenty-five people present, chiefly from the lower classes of the population. Feder's lecture was known to me from the courses, so I was able to devotemyself to an inspection of the organization itself. My impression was neither good nor bad; a new organization like so manyothers. This was a time in which anyone who was not satisfied with developments and no longer had any confidence in the existing parties felt called up onto found a new party. Everywhere these organizations sprang out of the ground,only to vanish silently after a time. The founders for the most part had no idea what it means to make a party-let alone a movement out of a club.And so these organizations nearly always stifle automatically in their absurd philistinism. I judged the 'German Workers' Party' no differently. When Feder finally stopped talking, I was happy. I had seen enough and wanted to leave when the free discussion period, which was now announced, moved me to remain, after all. But here, too everything seemed to run along insignificantly until suddenly a 'professor' took the floor; he first questioned the soundness of Feder's arguments and then-after Feder replied very well - suddenly appealed to 'the facts,' but not without recommending most urgently that the youngparty take up the 'separation' of Bavaria from 'Prussia' as a particularlyimportant programmatic point. With bold effrontery the man maintained thatin this case German-Austria would at once join Bavaria, that the peace would then become much better, and more similar nonsense. At this point I could not help demanding the floor and giving the learned gentleman my opinionon this point-with the result that the previous speaker, even before I was finished, left the hall like a wet poodle. As I spoke, the audience had listened with astonished faces, and only as I was beginning to say goodnight to the assemblage and go away did a man come leaping after me, introduce himself (I had not quite understood his name), and press a little bookletinto my hand, apparently a political pamphlet, with the urgent request that I read it. This was very agreeable to me, for now I had reason to hope that I might become acquainted with this dull organization in a simplerway, without having to attend any more such interesting meetings. Incidentallythis apparent worker had made a good impression on me. And with this I leftthe hall. At that time I was still living in the barracks of the SecondInfantry Regiment in a little room that still very distinctly bore the traces of the revolution. During the day I was out, mostly with the Forty-First Rifle Regiment, or at meetings, or lectures in some other army unit, etc. Only at night did I sleep in my quarters. Since I regularly woke up beforefive o'clock in the morning, I had gotten in the habit of putting a few left-overs or crusts of bread on the floor for the mice which amused themselvesin my little room, and watching the droll little beasts chasing around after these choice morsels. I had known so much poverty in my life that I was well able to imagine the hunger, and hence also the pleasure, of the littlecreatures. At about five o'clock in the morning after this meeting, I thuslay awake in my cot, watching the chase and bustle. Since I could no longer fall asleep, I suddenly remembered the past evening and my mind fell onthe booklet which the worker had given me. I began to read. It was a littlepamphlet in which the author, this same worker, described how he had returnedto national thinking out of the Babel of Marxist and trade-unionist phrases; hence also the title: My Political Awakening.l Once I had begun, I read the little book through with interest; for it reflected a process similar to the one which I myself had gone through twelve years before. Involuntarily I saw my own development come to life before my eyes. In the course of theday I reflected a few times on the matter and was finally about to put it aside when, less than a week later, much to my surprise, I received a postcard saying that I had been accepted in the German Workers' Party; I was requested to express myself on the subject and for this purpose to attend a committee meeting of this party on the following Wednesday. I must admit that I was astonished at this way of 'winning' members and I didn't know whether to be angry or to laugh. I had no intention of joining a ready-made party, but wanted to found one of my own. What they asked of me was presumptuous and out of the question. I was about to send the gentlemen my answer in writing when curiosity won out and I decided to appear on the appointed day to explain my reasons by word of mouth. Wednesday came. The tavern in which the said meeting was totake place was the 'Aites Rosenbad' in the Herrenstrasse, a very run-down place that no one seemed to stray into more than once in a blue moon. No wonder, in the year 1919 when the menu of even the larger restaurants could offer only the scantiest and most modest allurements. Up to this time thistavern had been totally unknown to me. Meanwhile, I had again become very curious, and waited expectantlyfor what was to come. Now at least I came to know the names of the individualgentlemen. The chairman of the 'national organization' was a Herr Harrer,that of the Munich District, Anton Drexler. The minutes of the last meeting were read and the secretarywas given a vote of confidence. Next came the treasury report- all in allthe association possessed seven marks and fifty pfennigs ­p; for which the treasurer received a vote of general confidence. This, too, was enteredin the minutes. Then the first chairman read the answers to a letter from Kiel, one from Dusseldorf, and one from Berlin, and everyone expressed approval. Next a report was given on the incoming mail: a letter from Berlin, one from Dusseldorf and one from Kiel, whose arrival seemed to be received with great satisfaction. This growing correspondence was interpreted as the bestand most visible sign of the spreading importance of the German Workers'Party, and then-then there was a long deliberation with regard to the answers to be made. Terrible, terrible! This was club life of the worst manner andsort. Was I to join this organization? Next, new memberships were discussed; in other words, my capture was taken up. I now began to ask questions-but, aside from a few directives, there was nothing, no program, no leaflet, no printed matter at all, no membership cards, not even a miserable rubber stamp, only obvious good faith and good intentions. I had stopped smiling, for what was this if not a typical sign of the complete helplessness and total despair of all existing parties, their programs, their purposes, and their activity? The thing that drovethese few young people to activity that was outwardly so absurd was only the emanation of their inner voice, which more instinctively than consciously showed them that all parties up till then were suited neither for raising up the German nation nor for curing its inner wounds. I quickly read the typed 'directives' and in them I saw more seeking than knowledge. Much was vague or unclear, much was missing, but nothing was present which couldnot have passed as a sign of a struggling realization. I knew what these men felt: it was the longing for a new movement which should be more than a party in the previous sense of the wold. That evening when I returned to the barracks I had formed myjudgment of this association. I was facing the hardest question of my life: should I joinor should I decline? Reason could advise me only to decline, but my feeling left me no rest, and as often as I tried to remember the absurdity of this wholeclub, my feeling argued for it. I was restless in the days that followed. I began to ponder back and forth. I had long been resolved to engage in political activity; that this could be done only in a new movement was likewise clear to me, only the impetus to act had hitherto been lacking.I am not one of those people who begin something today and lay it down tomorrow,if possible taking up something else again. This very conviction among others was the main reason why it was so hard for me to make up my mind to joinsuch a new organization. I knew that for me a decision would be for good, with no turning back. For me it was no passing game but grim earnest. Even then I had an instinctive revulsion toward men who start everything and never carry anything out These jacks-of-all-trades were loathsome to me.I regarded the activity of such people as worse than doing nothing. And this way of thinking constituted one of the main reasons why I could not make up my mind as easily as some others do to found a cause which either had to become everything or else would do better not to existat all. Fate itself now seemed to give me a hint. I should never have gone into one of the existing large parties, and later on I shall go intothe reasons for this more closely. This absurd little organization withits few members seemed to me to possess the one advantage that it had not frozen into an 'organization,' but left the individual an opportunity forreal personal activity. Here it was still possible to work, and the smaller the movement, the more readily it could be put into the proper form. Here the content, the goal, and the road could still be determined, which inthe existing great parties was impossible from the outset. The longer I tried to think it over, the more the convictiongrew in me that through just such a little movement the rise of the nationcould some day be organized, but never through the political parliamentary parties which clung far too greatly to the old conceptions or even sharedin the profits of the new regime. For it was a new philosophy and not anew election slogan that had to be proclaimed. Truly a very grave decision-to begin transforming this intention into reality! What prerequisites did I myself bring to this task? That I was poor and without means seemed to me the most bearable part of it, but it was harder that I was numbered among the nameless, thatI was one of the millions whom chance permits to live or summons out of existence without even their closest neighbours condescending to take any notice of it. In addition, there was the difficulty which inevitably arose from my lack of schooling. The so called 'intelligentsia' always looks down with a really limitless condescension on anyone who has not been dragged through the obligatory schools and had the necessary knowledge pumped into him. The question has never been: What are the man's abilities? but: What has he learned? To these'educated' people the biggest empty-head, if he is wrapped in enough diplomas,is worth more than the brightest boy who happens to lack these costly envelopes.And so it was easy for me to imagine how this ' educated ' world would confrontme, and in this I erred only in so far as even then I still regarded people as better than in cold reality they for the most part unfortunately are.As they are, to be sure, the exceptions, as everywhere else, shine all the more brightly. Thereby, however, I learned always to distinguish between the eternal students and the men of real ability. After two days of agonized pondering and reflection, I finally came to the conviction that I had to take this step. It was the most decisive resolve of my life. From here there was and could be no turning back. And so I registered as a member of the German Workers' party and received a provisional membership card with the number 7.